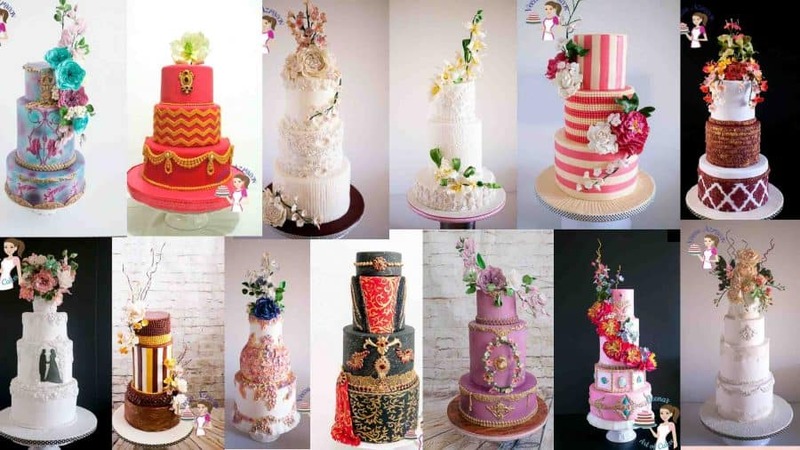 Do you know what is your cake decorating style? Every profession or artist has his or her own style. Sometimes figuring out what your own personal style is can be challenging. Here are a few tips that might help. These are some of my cakes. Do these speak for my Cake Decorating Style yet? 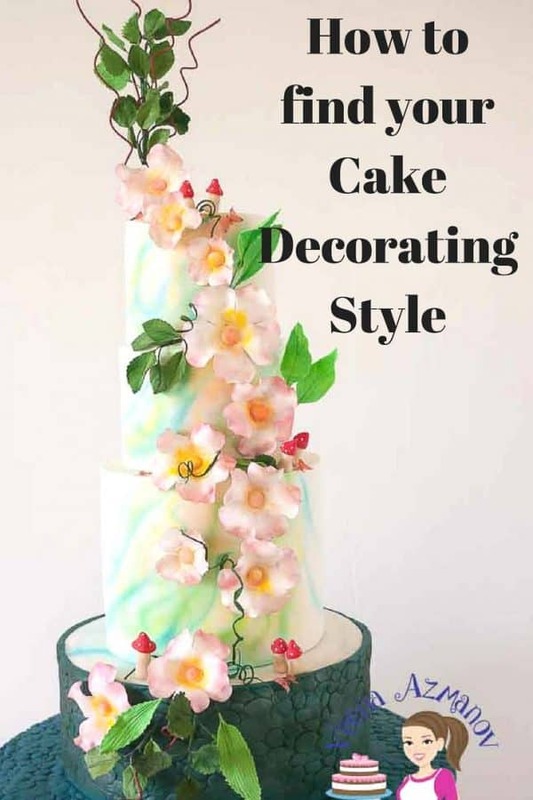 What is your Cake Decorating Style? Just as a doctor or lawyer specializes in some aspect of their profession. We too are driven into a particular area of cake decorating driven by our passion and talent. For example, a medical student may decide he wants to be a doctor in the field – dentist, surgeon or a lawyer chooses either criminal, domestic etc. Every cake decorator has his or her own style of decorating cakes. This style usually comes from the person’s background, from their personal preferences or even personality. 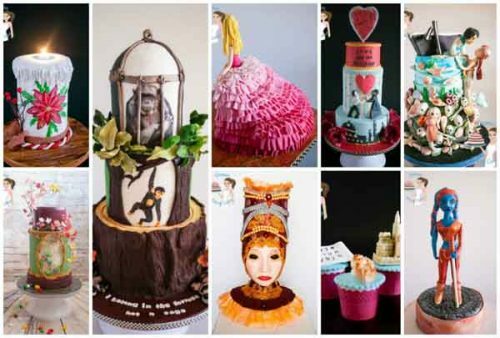 If I said Karen Portaleo, Peggy Porschen, Ron Ben Israel, the very first thing that comes to your mind is the type of cakes that these artists create. Their unique styles and expertise. 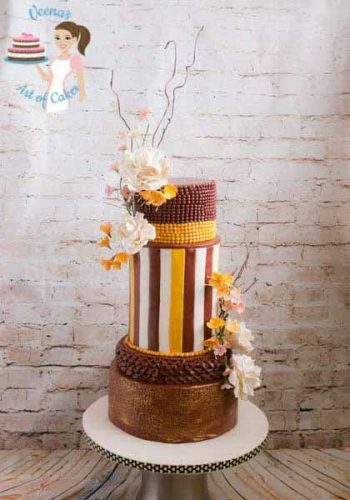 Karen Portaleo has a background in sculpting and a pastry chef grandfather – eventually, she combined the two and now she’s the most amazing cake and chocolate artist who travels across the globe to teach the art of cake sculpting!!! Yes, she makes the most amazing and unique sculpted cake I have EVER seen. You can see them here on her Facebook Page Karen Portaleo, Cake Artist. Ron Ben Israel got his love for food at a very young age in the kitchen with his own mom. Peggy Porschen left home at a young age to pursue her passion for cakes. While Karen Portaleo brings to mind the amazing art of cake sculpting, Peggy Porschen brings the element of elegant, classy and sophisticated tiered wedding cakes and Ron Ben Israel being so popular for his sugar flowers brings to mind a cake lusciously filled with the most exotic array of sugar flowers. What would happen if you asked Peggy Porschen to make cakes like Karen Portaleo or vise-versa! Would that work? Probably not!! maybe…. But that’s not their style, no preference or desire. Maybe not even their talent. It’s not them!! 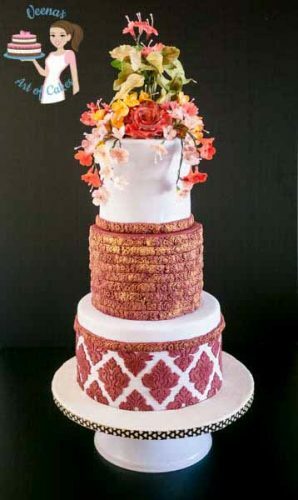 Often you get a very talented cake artist who is so unhappy with her cakes and exposure because she is unable to make those fancy cakes she sees everybody else is making. Don’t get me wrong – I’ve been there too! We all go through it and we all feel the grass is greener on the other side. “Maybe if I tried those types of cake, my cakes would be better noticed” Will they? The current trend in cakes seems to be gravity-defying cakes. Is this the type of cake I want to do? Am I doing it because I like it or am I doing it because everybody else is doing it? Am I doing just one such cake for fun or do I want to get more orders for such cakes? Remember the cakes you showcase in your portfolio speak for your style and your talent. When people visit your website and see more of a certain type of cakes that’s what they will assume you specialize in. Most importantly ask yourself – what are the cakes that make me happy when working on them? Do you like novelty cakes, wedding cakes, sugar figures, painting, royal icing work, sugar flowers? what really brings out the best in you? Trends change all the time. Do you see any of the above three cake artists suddenly stop doing what they are doing and start making gravity-defying cakes because they all want to fit in? NO!! They do what they do best because that’s them! They have found their path. Does this mean that you have to stop exploring other aspects of cakes? NO!! Of course not! It is great to know and explore all areas of cake decorating. You see the sugar modeling below – sugar modeling is not my forte but I do them for fun!! 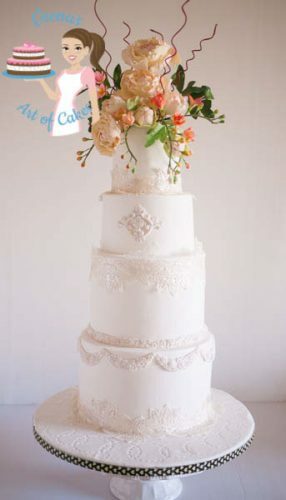 While it is great to explore other aspects of cake decorating it is very important to know and appreciate what is unique about you and your style of cake decorating. All it takes is you being true to yourself. Once you do that you will find that you are working in sync with your inner being. You will achieve a goal, you will achieve a purpose, you will find your path. You will unleash your own unique creativity and style. So what is my Cake Decorating Style? I love doing tired cakes, I love bold colors, sugar flowers, lace, ruffles, pearls, fabrics, molds etc. If I had to choose a cake to make it would be a wedding cake. Yes!! I love weddings! And I love classic elegant cakes with sugar flowers. So I showcase that more on my website letting people know that I’m good at Wedding Cakes and Sugar Flowers. But while I am most happy with my above style, I do some novelty cakes, and sugar modeling for fun too! Those make me happy and give me some adventure but I’m not overly upset if I don’t make a perfect figure. It’s not my goal. I work on my sugar flowers and try to perfect my fondant skills because now I know my path. I know what makes me happy, I know what is my unique skill, what aspect of cake decorating is ME! This also helps me know what type of cake clients I want to attract. It defines my target marketing when choosing to advertise my business. 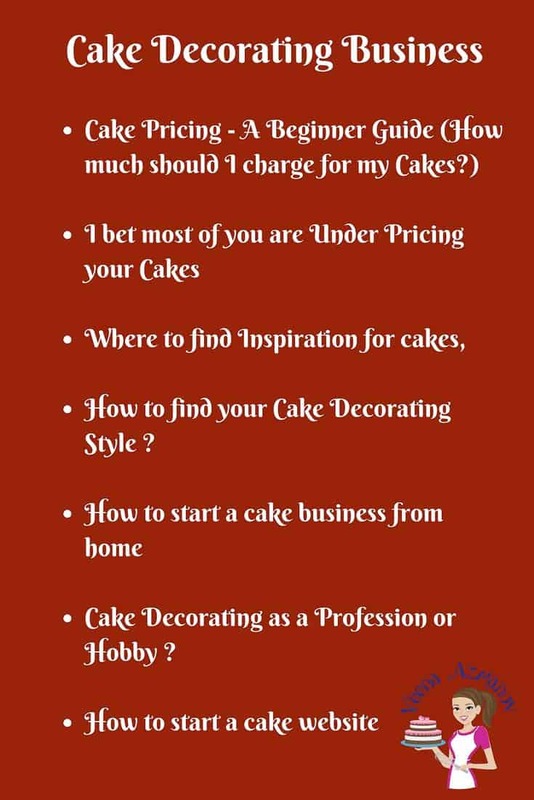 So, Now I ask you – Do you know what is your cake Decorating Style? If yes, please see it with me in the comments below. Tell us how you came to identifying or understanding your own style. and If not, then here are a few questions to ask your self. Which cake in your gallery is your favorite? Why? What is the one thing about a cake that you don’t like doing? Would omitting a cake category (Ex- novelty cakes) help. These are of course just a few question ideas to ask yourself, but I think you get the idea of what I’m trying to share here. I do hope you have found this post useful. If you did please help spread the word by sharing it with your friends on any social media of your choice. Thank you so much. Previous Post: « Which Online Cake Decorating Schools Should I join? Hi Veena. This article was made for me and at the right time. I love making beautiful children and baby shower cakes. I also love making beautiful gumpaste flowers and maybe fabric designs for kids too. I get so excited seeing these types of cakes and decorations. Thanks for inspiring me. I’m humbled. Thank you so much Barbara. I am so happy to hear you say that. Ohh, what a great read, Veena! It really opened my eyes and helped me tremendously! I’ll have to keep repeating that and follow my path, I love modelling figures, faces and details of objects, clothes, houses etc. You’re very inspirational, thank you! Thank you so much Adelina. So glad you found it useful. Sound great Troy. thank you ! I have had this article in my reading tabs for a while now and haven’t had a chance to read it. I think I was meant to find it now, wow! I couldn’t have read this at a better time! Gravity defying cakes are very big at the moment, as you say, and that just isn’t me! Thank you for showing me that I don’t have to make these cakes to ‘fit in’. You really don’t understand that it has helped so much! Thank you so much for this!! I have been struggling with making cakes like other people – ie fondant- because that is what the so-called experts say to do, follow the crowd! Your post has helped me realize the error of my ways and that I should do what I love and it will show in my work. Thank you!!!!! Thank you so much for your blog and for sharing your wisdom, you and your work are truly inspirational. I'm struggling quite a lot with my "style", I seem to be stuck in a rut, making mostly novelty cakes when my true passion is wedding cakes, Lambeth method style piping and sugar flowers. Do you have any tips for steering my business more in that direction? My usual orders are for birthday cakes, what can I do to attract customers for wedding cakes? I'd love to hear any advice you could give me. Sorry Rose.. Looks like I missed your message here. Not sure how that happened. I understand that we all get carried away in what is not our style just because we are driven by our customer request and our business. I’m not saying you should stop doing those things. I’m said you should focus on what is important to you and not let yourself be bothered by things that are not in your niche. Wow.. Thank you so much for this post. Your blog is truly so inspiring. I have learned so much!! Thank you so much. This makes so much sense. I recently tired to do a gravity defying cake. I did not enjoy it and nor was it my best work. I only did it cause I thought it was necessary to do what everybody else is doing. This post truly helps clarify everything. Sorry not sure how I missed your message. I know exactly what you mean Samantha. I use to have the same problem. I’m not a big fan or gravity defying cakes and it has become such a trend that you begin to get jealous of all those cakes and beat your self up that you cannot do them. Such a state of mind is not a happy place to be. I’m glad you found this post useful. Thank you so much for commenting. Thank you so much for this post!! Really is very helpful. I have recently been going back and forth with things that I want to do. I keep trying to do everything instead of just doing what I like. Your post just simply showed me my path. Thank you so much. This one post is going to mold mold my career. Thank you Anne.. I’m so happy to hear this has been helpful. Appreciate you commenting and letting me know.